Written by Catherine Saxelby on Monday, 27 April 2009. Over the past 20 years, portion sizes have grown bigger and bigger. Nutritionists are convinced huge portions are a major contributor to our obesity problem. They've even coined a name for it - ‘portion creep'. Look at how these six everyday foods have become supersized. When you popped the corn kernels at home in a pan, a serve was a cup full. With a knob of butter melted in, you get a reasonable 1265kJ (300cals). These days, popcorn at the movies comes in a huge ‘Maxi box' and adds 3455kJ (825cals). And we all try to eat our way to the bottom of it! But wait. There's more. For only $2 more, you can upsize from a ‘Maxi' box to a ‘Super Mega' box. 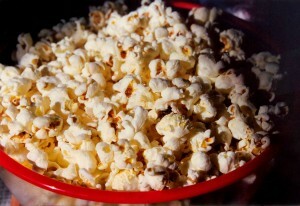 You get double the weight of popcorn - AND double the fat and kilojoules! When Coca Cola was first created in 1915, a ‘single serve' was the iconic 250ml waist bottle. Just enough to quench your thirst and add a little refreshment to your day. It came in at 450kJ (107cals). Now we sip the 600ml buddy-size bottle. It too is regarded as a ‘single serve'. But it slugs you a hefty 1080kJ (258cals) more than twice as much - plus a lot of sugar. Not good for you. Juice used to come in a smallish 200ml glass. With 285kJ (70cals), that's the size of juice that is equivalent to one whole piece of fruit if you're on a diet. Not a lot. Today, at those trendy juice bars, a 600ml tumbler is often the smallest size you can order - equal to 4 pieces of whole fruit. And yes even though it's healthy, there's still 855kJ (205cals) in that bucket of juice. If you don't burn it off, it will go where all the rest of the excess goes - to bulk out those love handles! Download my free Fact Sheet on Portion Size Control. Read how portion sizes have gotten bigger and why you'll eat more if you're served a biggish portion! Muffins once were small cup cakes weighing around 55g and leaving us with 810kJ (195cals). They were a home-made treat but a small one so didn't do damage to your diet. Now muffins balloon out of their paper case and weigh a hefty 175g. At this weight, you get landed with 2580kJ (615cals) with your morning coffee. It's value for money but not for our waists! When McDonalds first released their crispy fries, they came in a small paper bag and weighed only 72g. They weren't the best things for your health but everyone loved them with their burger. Forget the 925kJ (220cals) they added on. Today thanks to super-sizing, this small paper bag of fries is the smallest of four sizes sold in McDonalds. Far more popular is the 200g cardboard box of fries which stacks on double the fat and kilojoules at 1670kJ (400cals). Often you get offered free fries with your burger or asked if you want to upsize to the large size for the same price. A ‘standard' glass of wine, red or wine, holds a tiny 100ml of wine. This is the size that's used as the standard drink to yield 10 grams of alcohol. This concept of a standard drink has been used as the basis of drink drinking laws and for recommendations for safe intake of alcohol to avoid the risk of cancers and liver disease. It's small - and supplies only 270kJ (65cals). In contrast, sip from the trendy balloon glasses popular these days and you'll notice that they can hold up to 250ml - over twice as much as the 100ml. You think this is a ‘standard drink' but it's double what you should drink. And leaves you with 675kJ (160cals). Grab a copy of my free download Portion Caution which shows you - at a glance - how popular foods have been upsized in recent times.